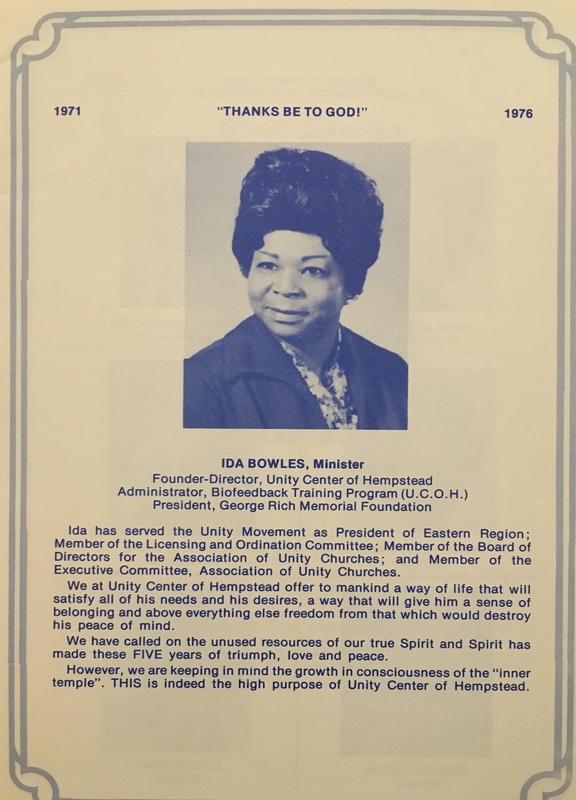 Ida Bowles was an African-American Unity minister who was ordained in 1962. Rev. Ida, as she is affectionately called, came to New York from Chicago, Illinois at the request of Unity School of Christianity in 1959. She was appointed minister of the Unity Center in Harlem in 1960. Under her leadership, the Center grew, and expanded its activities for a number of years. In 1971, in obedience to the Holy Spirit, Rev. Ida was led to open a Unity Ministry in Hempstead. Unity Church of Hempstead had its first service at the Hempstead Y.M.C.A. Sunday, September 19, 1971, with The Rev. Ida Bowles Smith as Founder-Minister. Rev. Ida believes that people everywhere should know the Truth about their relationship to God and Oneness of all life. A firm believer and practitioner of the teachings of Jesus Christ and a much sought after speaker, she has travelled extensively spreading the “good news” of The Divinity of Man. She was very active for many years at the executive level in the Association of Unity Churches. She has served as a member of the Board of Directors and the Licensing and Ordination Committee, a member of the Executive Committee, and President of the Eastern Unity Ministers’ Association. Locally, she has served as a member of the Nassau County Advisory Council on Drugs and Alcohol; The Community Advisory Board of Hempstead General Hospital Medical Center; Hofstra University’s Hofstra For Hempstead Committee; Board Member and Secretary of Hempstead Chamber of Commerce. She is a heritage subscriber of The NAACP. Key Women of America - Humanitarian Award. Hofstra University - The Unispan Award NAACP - "Humanitarian Award"
She is listed in Marquis Who’s Who of American Women,12thEdition andWho’sWhoIntheEast, 19th Edition. Rev. Ida’s primary concern has been and still is with the spiritual growth and well-being of her “flock” and others. She is never “too busy” for anyone because she lives to serve. She speaks often of the young people and how important it is for them to know themselves as spiritual beings, heirs of God and joint-heirs with Jesus Christ. Rev. Ida has consistently taught and preached the Truth and is a living witness that God always keeps His promises. She continues to prove God as her all sufficiency in all things. A profound awareness of Truth, perseverance, patience and unwavering faith in God has enabled her to successfully shepherd Unity Church of Hempstead through the past 25 years. She is a truly loving, caring, understanding and generous leader. We thank God for all the He has done and all that He shall continue to do through our Minister, Rev. Ida Bowles Smith. Unity Church of Hempstead (U.C.H.) is God’s idea - established by God, it is maintained and sustained by God each day. The Rev. Ida Bowles Smith, Founder-Minister was the channel through which this idea was conceived 25 years ago. With the approval and blessing of the Association of Unity Churches, the financial and all-around support of her late husband, and Co-Founder, Gasper Smith, and Rev. 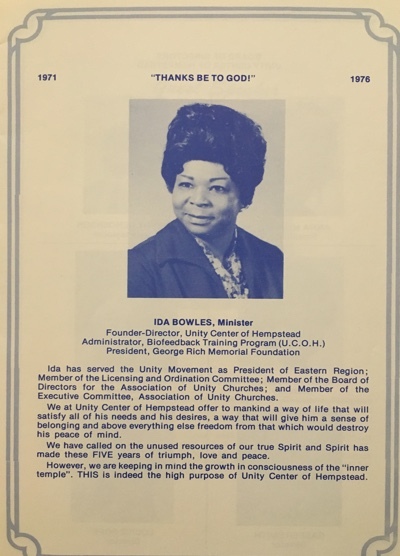 Ida’s unwavering faith in God, Unity Church of Hempstead held its first service September 19, 1971 at the Mid-Nassau YMCA. Unity Church has always been a teaching ministry and Truth study classes were held from the very beginning. The accommodations at the YMCA were not suitable for a growing church. It was obvious that U.C.H. needed its own “home.” A building was found and leased at 30 W. Columbia Street. The first service held there was in February, 1972. Many inspirational classes and activities took place during these early years - the first among them was a spiritual retreat in 1975 to Graymoor, Garrison, NY. It was entitled “Unity’s Adventure in Truth”. Everyone had a wonderful spirit-filled time. The church also had a privately sponsored half-hour weekly broadcast program on radio station WBAB AM/FM. It was eventually terminated at the request of Rev. Ida who felt that a permanent church home was more important than a radio broadcast at that time. As the church grew, a larger building was once again needed to accommodate the church’s increasing activities, which by now included a larger Sunday School for children. In March 1976, under the dynamic leadership of Rev. Ida, Unity Church of Hempstead purchased the building at 12 N. Franklin Street. The building was large enough for a growing congregation but extensive renovations were necessary. Again, Rev. Ida had the vision to see beyond the debris and the faith to know that the money-substance would be adequate to meet the needs as they arose. In a short time, the building was beautifully refurbished and U.C.H. held its dedication activities on October 8, 9 and 10 of the same year. Because of Urban Renewal (after only 4 years at 12 N. Franklin St.), Unity Church of Hempstead purchased its present location at 298 Fulton Avenue. And once again after extensive renovations, the Dedication Service was held January 18, 1981. God’s love and warmth can be felt immediately upon entering the church. At this point in our history, we have reached another milestone, which is the Twenty-fifth Anniversary. We are grateful to God and to the many souls who have made this accomplishment possible. However, OUR WORK IS NOT FINISHED. The past years at Unity Church of Hempstead have been exciting times as well as challenging times. They’ve been filled with countless personal demonstrations, physical healings and other examples of answered prayer. We give God the praise and the thanks, and we pray to always be open to the inspiration and guidance of the Holy Spirit. We look forward to the coming years with joyous expectancy, as we grow from fulfillment to greater fulfillment. Ida was a dynamic Truth Teacher & STAUNCH Fillmorean. She led Unity of Hempstead to purchase a building & then burn the mortgage. She LOVED children. 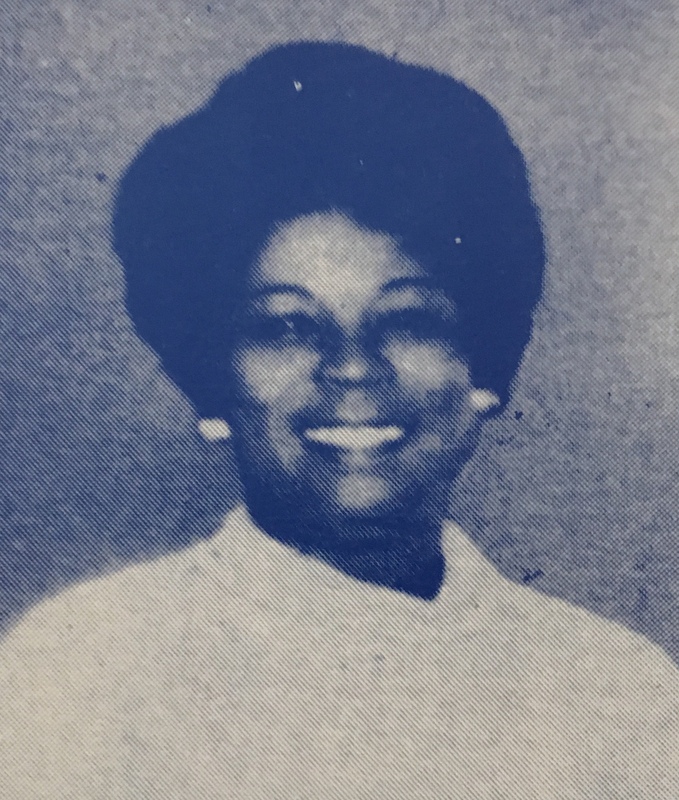 While in Hempstead she also served as Chaplain for the Police Dept. and on the Community Board of one of the local colleges. One of her infamous mantras was "Order is God's first law." She was a builder of leaders. 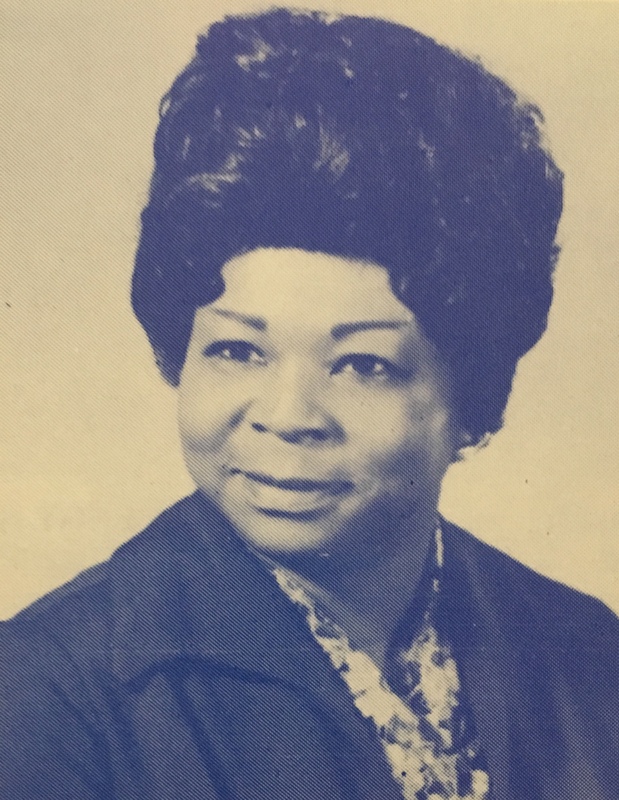 During her tenure at Unity of Hempstead she impacted the lives of 5 congregants who eventually became ministers. Ida was a demonstrator of prosperity. On July 14, 1999, at 8:10 p.m. Rev. Ida Bowles-Smith departed this life. She was born on January 4, 1922, in Lake Charles, Louisiana. Rev. Ida, as she is affectionately called, came to New York from Chicago, Illinois at the request of Unity School of Christianity in 1959. She was appointed minister of the Unity Center in Harlem in 1960. Under her leadership, the Center grew, and expanded its activities for a number of years. In 1971, in obedience to the Holy Spirit, Rev. 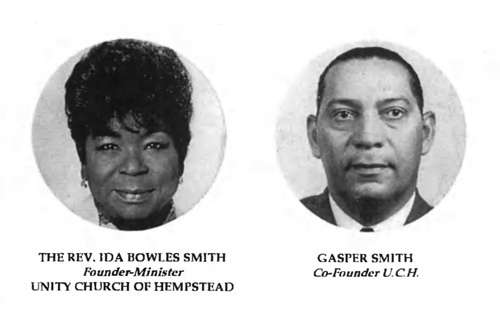 Ida was led to open a Unity Ministry in Hempstead. Unity Church of Hempstead had its first service at the Hempstead YMCA Sunday, September 19, 1971 with the Rev. Ida Bowles-Smith as Founding Minister. Rev. Ida was ordained in June 1962, by Unity School of Christianity. She was humbly grateful that God was using her as a channel of blessing for all people. Rev. Ida believed that all people everywhere should know the Truth about their relationship to God and the oneness of all life. She was a firm believer and practitioner of the teachings of Jesus Christ and a much sought after speaker. She traveled extensively spreading the “good news” of the Divinity of Man. She was very active for many years at the executive level in the Association of Unity Churches.